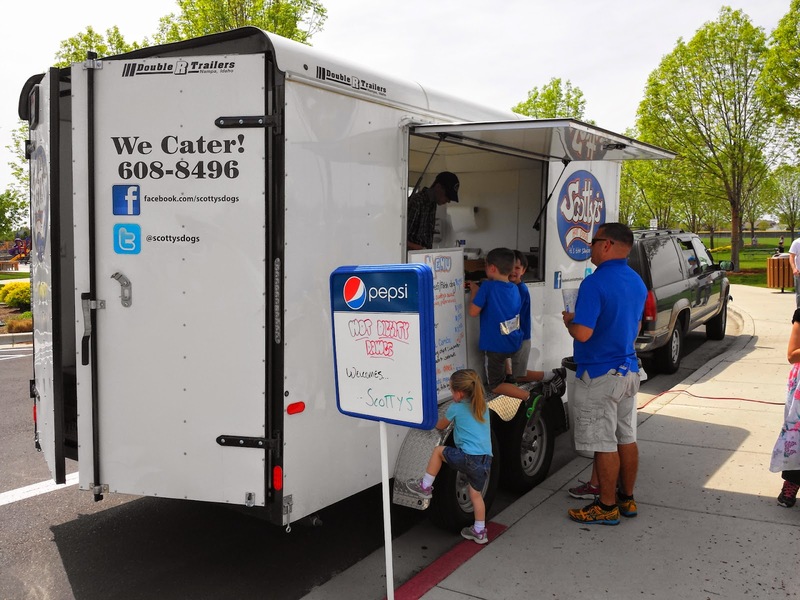 Scotty's Hot Dogs has been around for less than a year, but they've been pretty prolific. 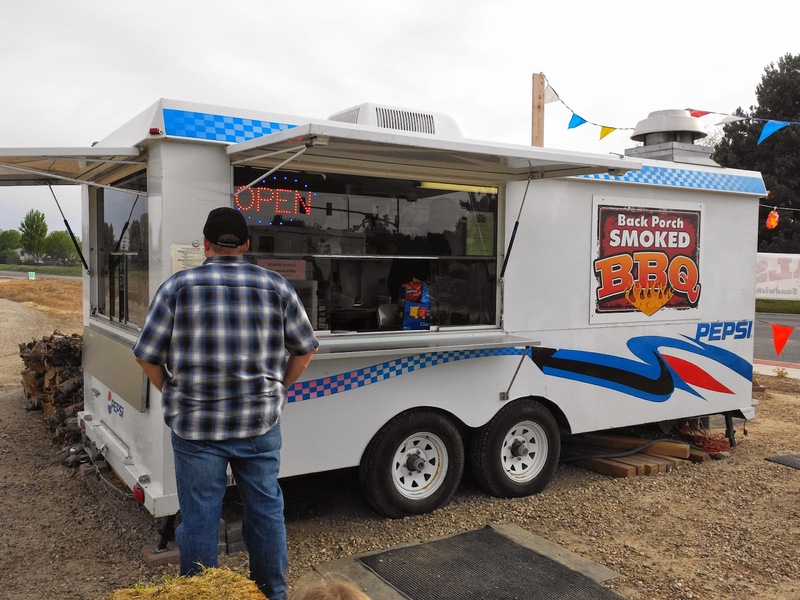 They have a couple of regular lunch spots, occasional gigs at places where adult beverages are vended, and have made appearances at Boise Music Festival and a few food truck gatherings. I caught up with them at Settler's Park in Meridian, where they were taking advantage of the warm weather crowds. As you can see, the menu is a little limited. If you're looking for mustard, chili, relish, sauerkraut, or (blech) ketchup, you're out of luck. 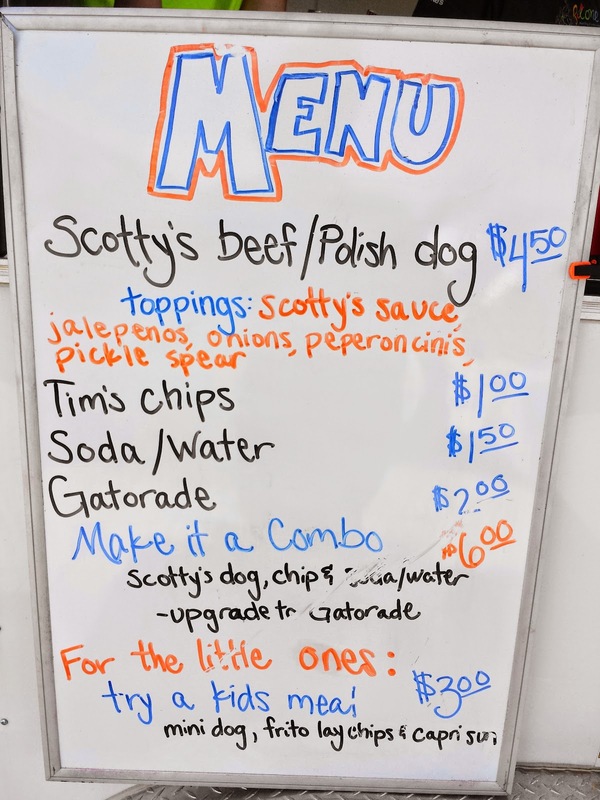 Scotty's specializes in two things: big dogs cross-cut and grilled, and their signature sauce. The staff are genuinely friendly and proud of their product. 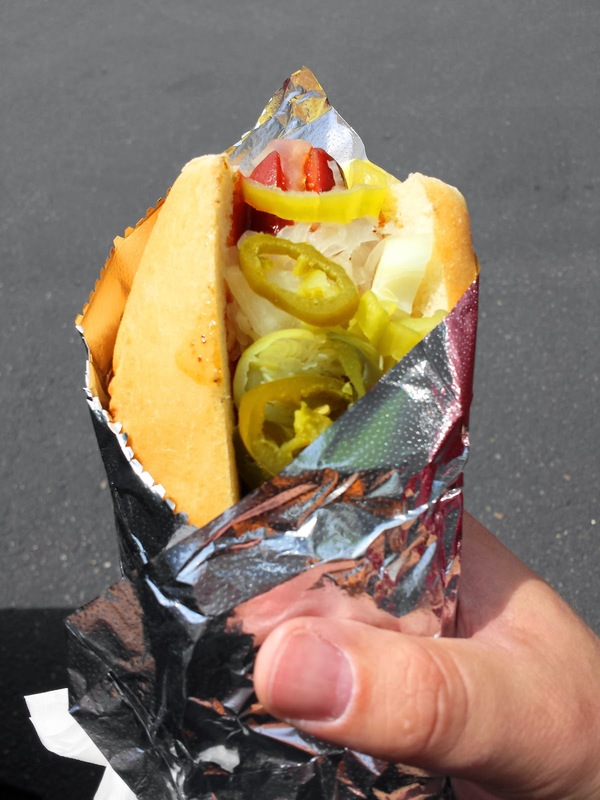 I'm something of a hot dog purist, and since I was going out of my comfort zone anyway, I decided to shoot the works and ordered one with everything. This was a good quality dog, and I'm a big fan of the cut-and-grill method, which I see far too rarely. Getting all of the available toppings might have been a mistake, because it was nigh impossible to eat the thing without making a mess. I have to say it though: I'm not a convert. The thin, red sauce was too sweet for my liking, and got very sticky as it dried. If they would make some of the more classic toppings available, I would definitely seek them out again, but I don't think that's likely to happen. Still, they seem to be doing pretty well with their own thing, so more power to them. Like most meat enthusiasts, warm weather turns my thoughts to barbecue. More so than normal, even. So when my roommate decided she wanted to hit up The Cheesecake Factory's curbside to-go service for a sandwich, I stopped at Back Porch Smoked BBQ on the way back home. After perusing their menu, I ordered a family meal to split with the roommate's younger child, a budding barbecue enthusiast in her own right. I chose the half pound of shredded pork, slaw and potato salad as my two sides, and added on a couple of ribs for good measure. Two things took me by surprise here. 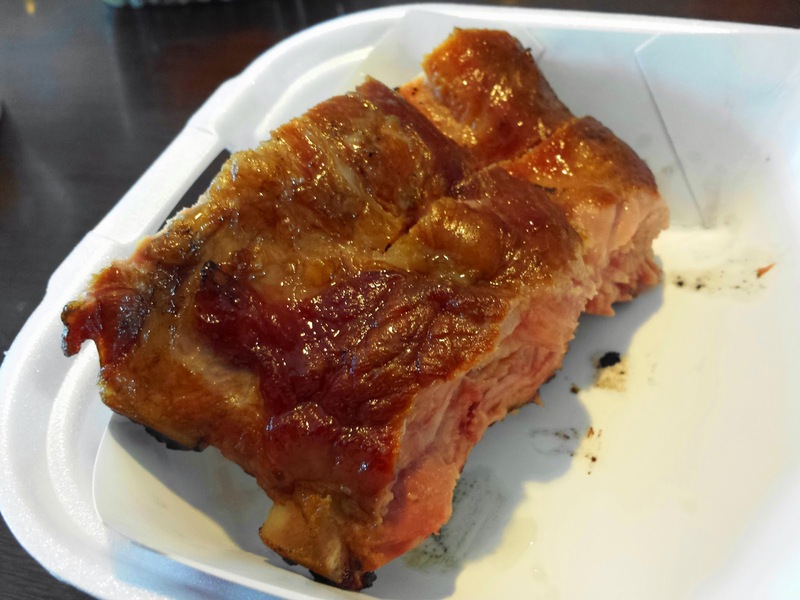 First, I was asked if I wanted the pork heated up or if I wanted to take it home and warm it myself. 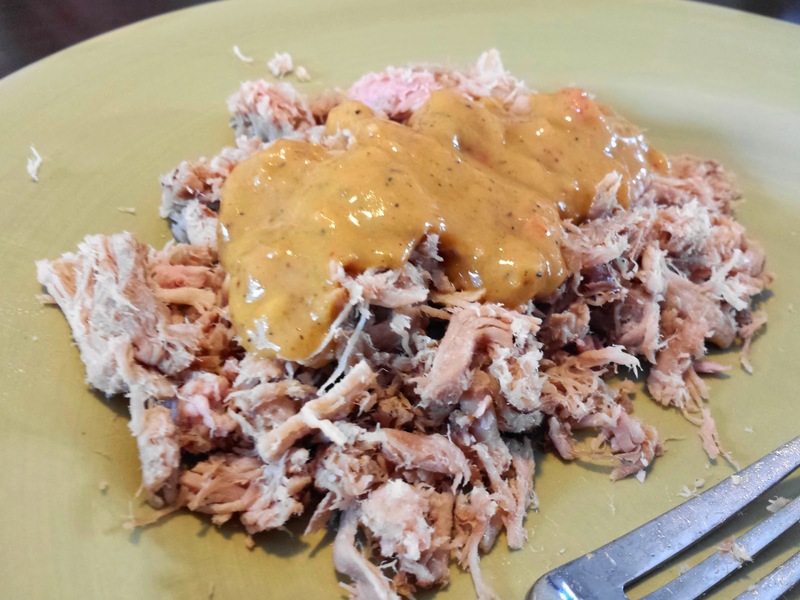 Second, when asked what sauce I wanted, I was given a choice of Sweet Baby Ray's (one of my favorite store-bought sauces, but still a national brand, pre-bottled one), or their house Carolina-style mustard sauce. I opted to have my pork heated and served with a little of each sauce. The kiddo decided to skip on the sides, but her mother sampled them. 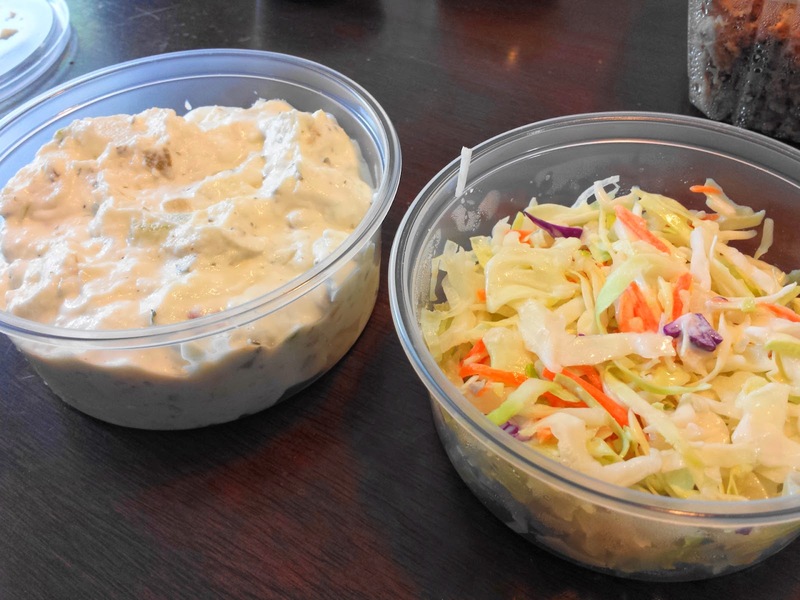 We both agreed that the slaw was one to pass on, being mostly dry and tasting basically like plain shredded cabbage. It got pushed to the side pretty quickly. The potato salad seemed to have been made with Greek yogurt rather than mayo, which took us aback at first, but I have to admit that it kept growing on me as I ate it. By the time I finished it, I was a fan. The ribs were a hit with both myself and my young dining companion, especially the skin. The kid has mentioned them several times in the days since, and if I were to return for anything, it would be more ribs. I would not return for the shredded pork, however. 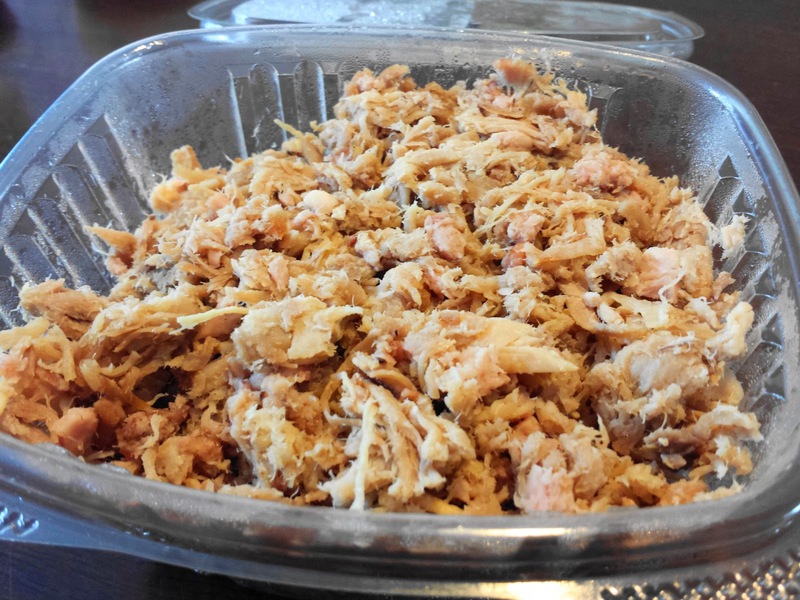 It was a little too finely shredded for me, a little dry, a little bland, and still a little chilly. I wasn't a big fan of the mustard sauce, either. It lent some much-needed moisture, but didn't have the tangy quality I'm used to in that style, not to mention being a little thick and kind of...chunky? I think I'll stick to my smoky sauces. The next morning, on my way back to Meridian, I finally stopped by a place that came up in a conversation about tamales on my Facebook page last year. Well, not a place so much as a car that happens to be parked across from the Catholic church at the corner of Meridian and Chinden on Sundays. 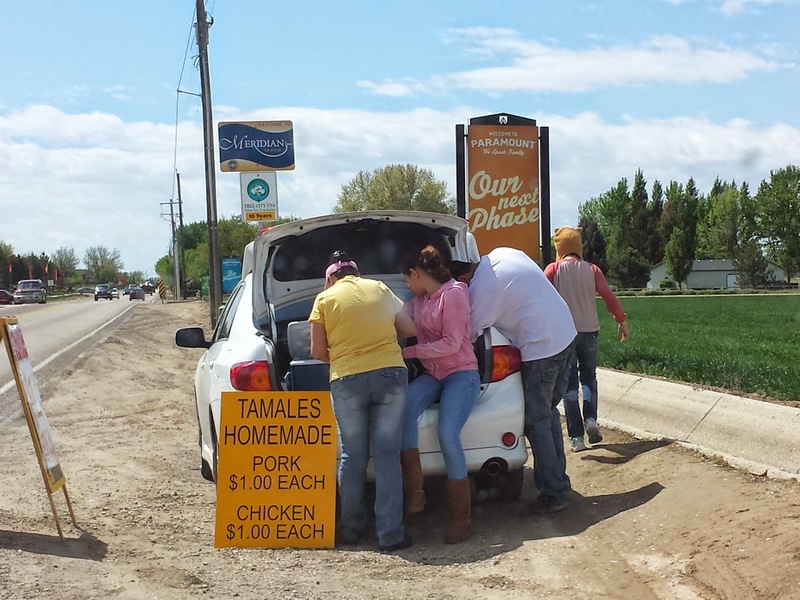 There, a woman and her kids peddle pork and chicken tamales for a buck a piece. I decided to surprise some of my family, and purchased ten of the pork ones. I was about to ask for recommendations for warming them, but when the bag was handed to me I could feel the heat coming through it. Nice! 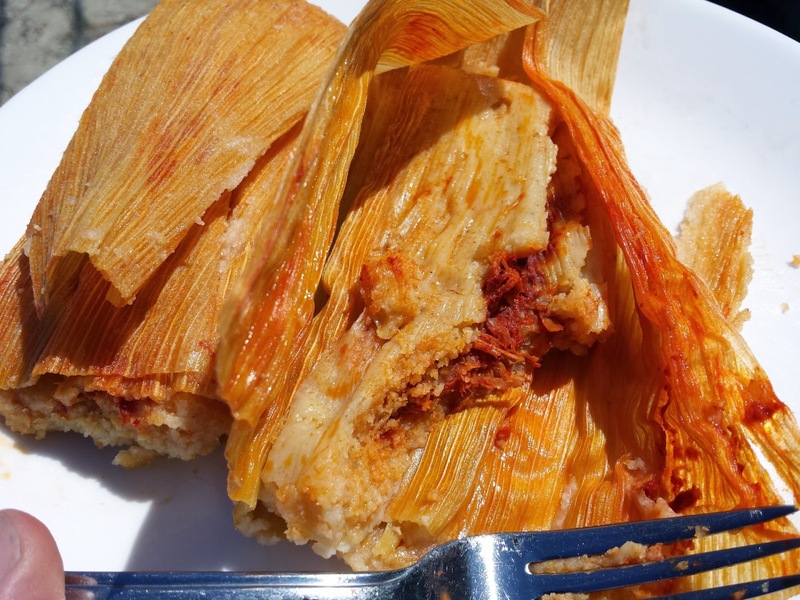 The tamales themselves were hot, moist, and big. When I cut into one, the angry red color of the filling had me bracing for spiciness that wasn't there. In fact, there just wasn't a lot of flavor at all. I was wondering for a moment if I'm becoming jaded or something, but my Mom (the biggest spice wimp I know), my eight year-old niece, and the roommate's six year-old daughter concurred, all saying they would be better with some kind of sauce. I don't know if they tone them down for the gringos or what, but I need a little more kick. Looks like I will continue to get my tamale fix at Lorena's. Not a very thrilling write-up, I know. Good dogs with toppings that didn't grab me, hit and miss barbecue, and tame-ales. Still, it was exciting to try so many new places in the course of less than 24 hours, and I'm sure there are those among you who would be perfectly happy with at least some of this stuff. You are, as always, invited to try the stuff yourself. I'm always up for hearing other people's opinions.